Start by printing the appropriate tournament brackets needed for the tournament, you can do this by clicking here. If you don't know the exact number of teams just estimate and print all of the brackets within a certain range. 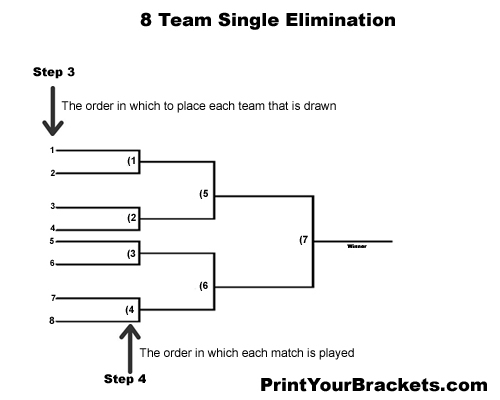 The single elimination tournament is best when you have a large number of teams and a short time frame. It is the easiest type of tournament to run. When a team wins they move forward in the bracket, and when they lose they're out. Option 1: The teams have already been set, everyone came to the tournament with their own partner or chose their partner once they arrived. Option 2: Place every player's name in a hat and draw two names at a time, those two players will be on a team. Now you will need to draw for the spots on the tournament bracket. You will place each team's name in a hat and begin drawing the teams one at a time. placing the first team drawn on the line numbered 1, the second team drawn on the line numbered 2 and so on. This can be viewed in the illustration below. Another option is to use our Random Tournament Matchup Generator tool, which will allow you to type in the team names and then automatically randomize the order in which you fill the bracket in. The tournament is ready to begin! Most of the brackets are numbered in the order the matches will be played. This can be viewed in the illustration below. If they are not numbered, start at the top left and work your way down until the first round is complete, then move to the next row(2nd round) and work from top to bottom. Continue the tournament until a winner has been decided. Reward the winner/winners of your tournament with something that let's them do a little boasting. Think trophies, t-shirts, plaques ect.... If you will be using our Large Tournament Brackets, you can even give the bracket to the winners as a souvenir.